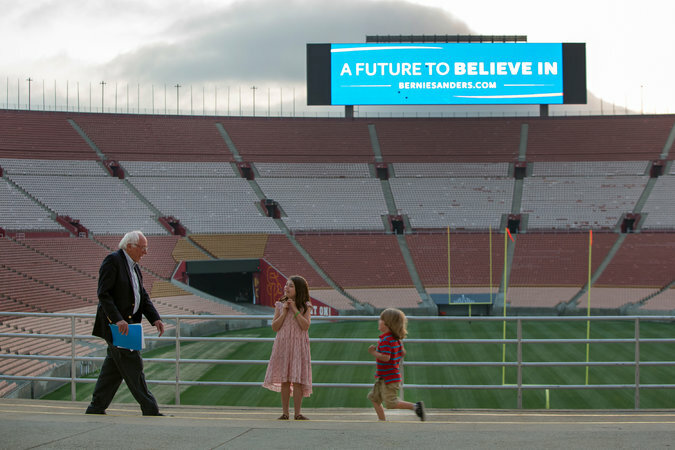 DAVIS, Calif. — In a rally here last week, 9,000 people came to hear Senator Bernie Sanders speak, some catching a glimpse from a parking garage roof. In Palo Alto, Calif., some of his 4,000 fans there pitched tents and put up umbrellas for shade from the sweltering sun. The wait to get into his speech in Irvine, Calif., where 6,000 people packed into an amphitheater, stretched to five hours. Mr. Sanders’s chances of winning the Democratic presidential nomination have been fading since Hillary Clinton’s big win in April in New York. With her victory on Sunday in Puerto Rico, she stands only 28 delegates short of securing the nomination, and she is almost certain to clinch it on Tuesday when New Jersey, California and four other states hold primaries. 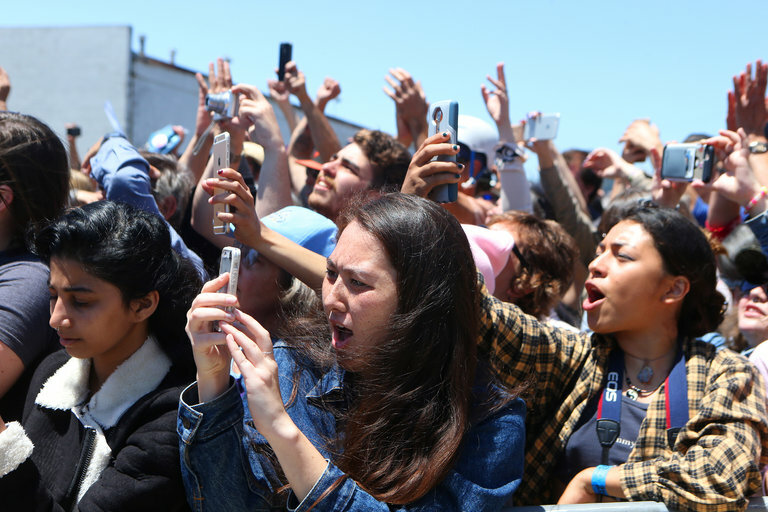 But one would not know that from the enthusiastic throngs of supporters who still flock to hear him call for a transformation of America’s economy and for a political revolution. Some are there in solidarity with his message, and others because they believe Mr. Sanders when he says, against the odds, that he can still snag the nomination at the party’s convention in July. And then there are many who, regardless of their outlook on the race, are streaming in for what they believe may be their last glimpse of a political phenomenon. Hafeez Alam, 26, a mechanical engineer from Irvine, said that his mother regretted not seeing Barack Obama in person in 2008, and that he was not going to have similar regrets. “It’s kind of like you listen to your favorite band on YouTube and you watch their concerts and DVDs, but when you go to a live event, it’s a totally different experience,” Mr. Alam said last month at the Irvine rally. Diana Modica let her children, Charlie Baldwin, 15, and Harriet Baldwin, 14, skip school to attend the Palo Alto rally last week. She said she was holding out hope that Mr. Sanders would win but also wanted to give her children a lesson in political participation. “The last time I saw a presidential candidate was Jesse Jackson in ’84 at Stanford, so you don’t get a lot of chances,” she said. “I just feel like this is, like, for a bucket list,” said Ms. Arroyo, 21. Mr. Sanders’s rallies — he has held at least one virtually every day for the past couple of weeks — have not had the feel of a vanishing campaign. His fans recite well-known parts of Mr. Sanders’s stump speech, chanting, “Health care is a right, not a privilege,” and screaming the average size of a donation to his campaign: “$27!” They carry handmade signs: “Bernie or Bust.” “Bernie Sensation.” “Wake up America. Smell the Coffee. It’s Berning.” They sway and dance to “Talkin’ Bout a Revolution” by Tracy Chapman and “Power to the People” by John Lennon. Vendors are still selling Sanders T-shirts, buttons and hats. 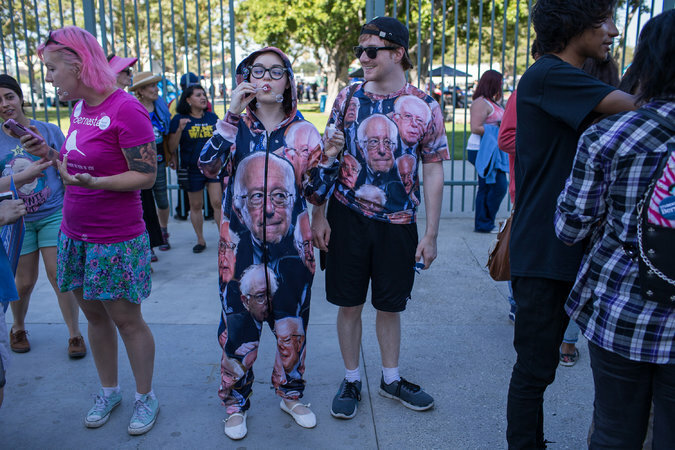 Lauren Steiner, 58, the lead organizer of Los Angeles for Bernie and one of several people selling T-shirts outside a rally in Santa Monica, Calif., said that Mr. Sanders had only a “slim chance” to win the nomination, but that a Bernie 2016 shirt was worth owning anyway, at least for sentimental reasons. Mr. Sanders, who declined to be interviewed, has been effectively camping out in California, hoping a win in the state will help him persuade hundreds of superdelegates — party leaders who can change their votes at any time before the convention — to withdraw support from Mrs. Clinton and back him. There appears to be little chance of that happening, and Mr. Sanders’s recent rallies have carried an angrier tone, punctuated with loud boos and insults at mentions of Mrs. Clinton or Donald J. Trump, the presumptive Republican nominee. But many realize that they may be seeing the last of Mr. Sanders on the campaign trail. Chuck Hollis, 69, of West Sacramento, who has attended three Sanders rallies in the past few weeks, said some friends have teased him for going to so many. Angela Collins, 48, of El Paso, does not believe Mr. Sanders has a chance. She is a Clinton supporter, but she attended a rally last month in Vado, N.M., because, she said, she did not want to miss seeing the senator.